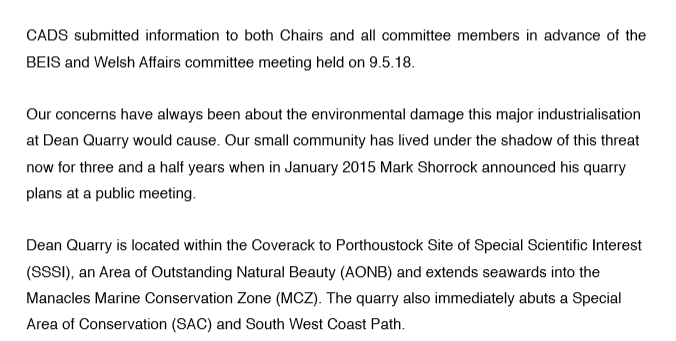 There are a number of environmental concerns about Shorrock’s plan to reopen the quarry, in order to supply the rock needed to build the Swansea Bay sea wall. The BBC also cover it here. And Private Eye also have the story, unfortunately not available on line. 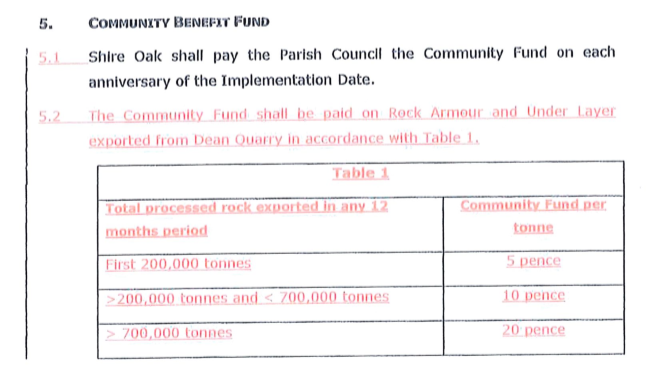 The Draft Agreement offered to pay the Parish Council amounts annually based on the amount of rock quarried. This, of course, is perfectly common and in order. For instance, wind farms often make similar payments. The handwritten comments make it clear what the PC thought about this offer, and the minutes from the PC’s next meeting on 15th July make clear that they had no intention of signing it. 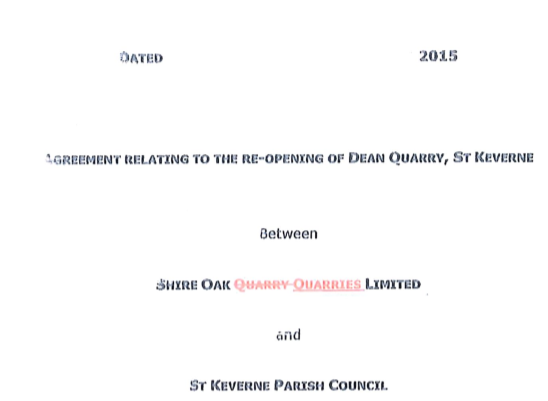 I gather that Shire Oak quickly withdrew this clause soon afterwards. To repeat, the offer to pay the local community compensation is not the issue. This is perfectly above board and reasonable. 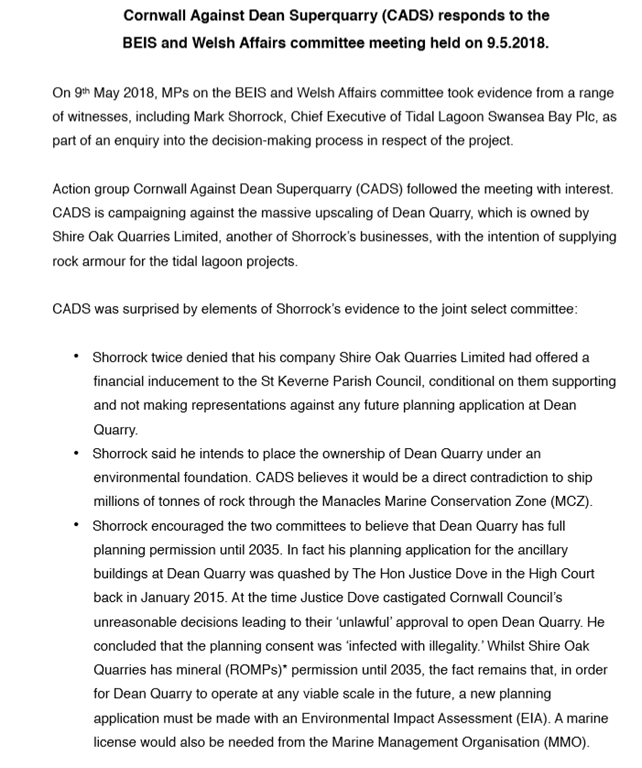 The problem lies with Clause 10, because it clearly ties in that financial compensation with the PC’s agreement to support Shire Oak’s planning application. Put another way, if the PC oppose the application, but planning is approved anyway, the Agreement is dead, and the local community will not receive a penny promised. 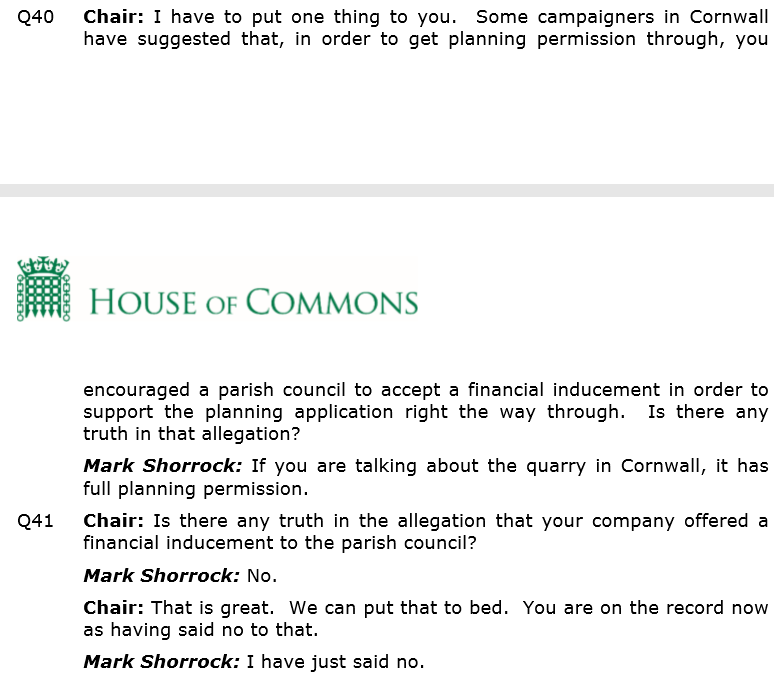 Some campaigners in Cornwall have suggested that, in order to get planning permission through, you encouraged a parish council to accept a financial inducement in order to support the planning application right the way through. Is there any truth in that legation? To deliberately mislead a Select Committee is a serious offence. Shorrock clearly has questions to answer. ← £23bn goes up in smoke! Chris Huhne’s pet scheme to fit ‘green’ energy boilers is open to fraud and makes pollution worse! I have a real problem with things like select committees. They interview and investigate some shady characters but do so with their hands tied behind their backs. In other words, whilst committees follow the rules, the shady characters rarely do so and if you’re not a shady character yourself, it’s almost impossible to pin these people down. This will undoubtedly prove another event the perpetrator is able to wriggle out from. Yes it’s even worse though when the select committee is stocked with shady characters as well. Margaret Hodge being the nonpareil. They could all save themselves a mountain of bother and disruption by just building a reliable power-on-demand gas-fired power station – or two. Great idea, but the troughers are so deep in the muck they can’t see the bleeding obvious. In order to save the environment we must first destroy it..preferably in the most profitable way. Interesting to note that Shorrock’s left hand man is Charles (I have no vested interest in renewable energy although I was energy minister in favour of subsidising renewable energy schemes) Hendry, no doubt with his snout waiting just above the trough. Is there any ruinable energy company that does not engage in corrupt practices? Note that Shorrock’s wife is Juliet Davenport, CEO of Good Energy, another well known ruinable energy trougher. The stink of vested interests of that lot even outstrips that of the sty. I noticed that Dale Vince was wetting himself on Facebook, ignoring the fact that he is full political/neo-commie climate crap to fill his wallet from the gullible. Dale Vince is hoping to win a large trough of subsidy for his own tidal lagoon projects in the Solway Firth. Mark Shorrock, everything a quack doctor purveying green nostrums, and slick salesman motor mouth should be, an excellent smoke and mirrors magician, a conjuror with words and black arts thrown in. I know the Brits did not invent sleaze, but they are very good at it. 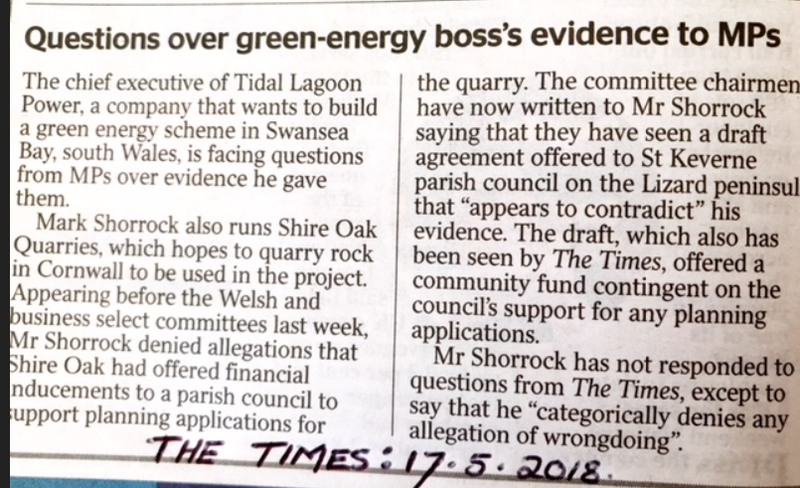 As I have hinted before, as far as I can see the Swansea lagoon has “cash for ash” potential, with the project being paid a full subsidised price for electricity it produces, while buying market price electricity to pump additional water at high and low tide to maximise total gross generation (and hence subsidy). This is no different to being paid more than the cost of fuel to burn it under “cash for ash” in Northern Ireland. As I have pointed out before, there is potential for a “cash for ash” scandal over the tidal lagoon, with power bought at market prices being used to pump additional water over at high and low tide to maximise gross subsidised generation – way beyond what would be economic in a pure market context. 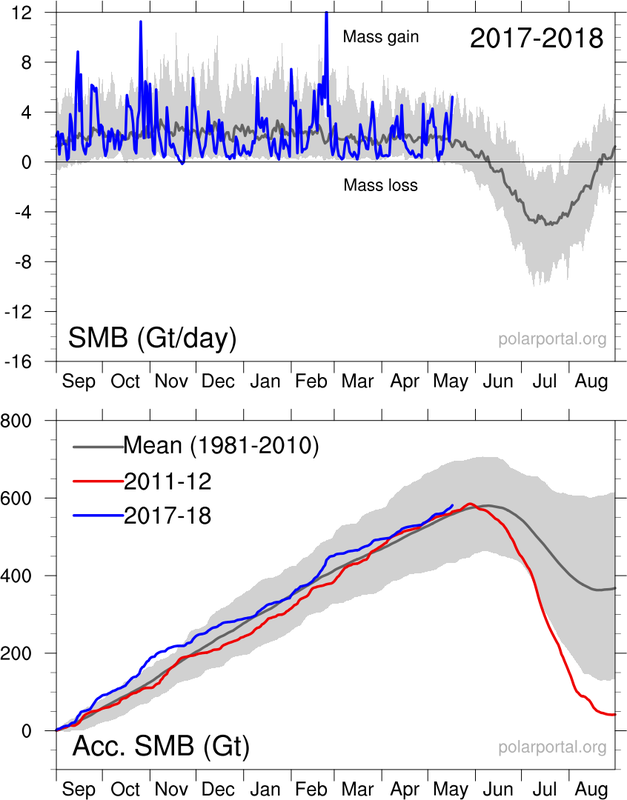 Taking the Temperature, which focuses on the battle against climate change and the people and ideas making a difference. Does anyone think it’s OK for BBC to carry this kind of paid for POLITICAL CAMPAIGNING ? The simple truth is that most people equate the BBC with the country’s conscience; and believe its campaigns are all wonderful, and its presenters akin to gods; and that the whole system is never ludicrous, or sordid, or mendacious. It would, literally, shatter the minds of half the population if they had to face facts. Name a time when Left or Remain showed up for a FAIR debate, (ie one where the panel wasn’t loaded in their favour first) ?